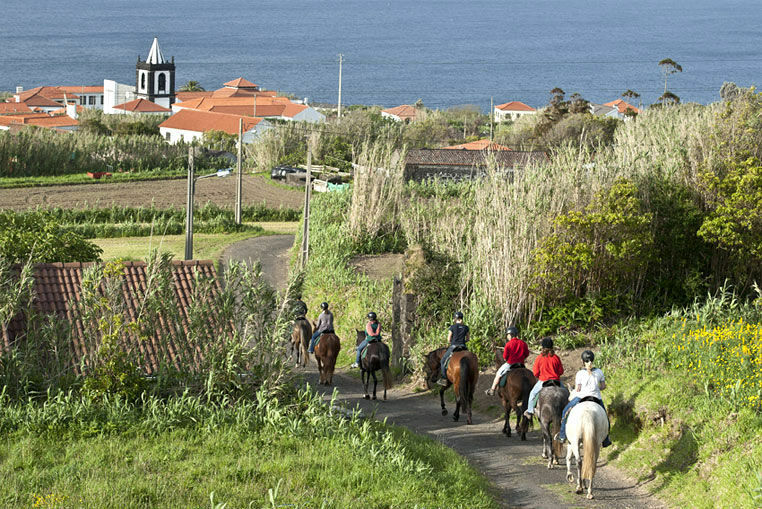 Lusitano horse ride trail along the north coast of Faial Island. No horseback riding experience required! 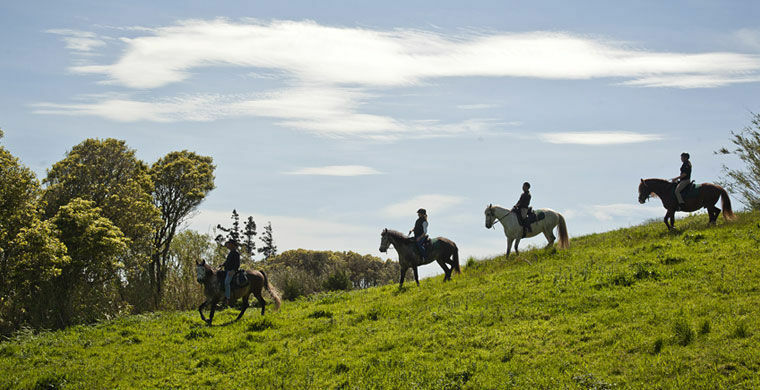 The meeting point is in our cavalry, Quinta do Moínho, located at the beautiful village of Cedros. Before the trail, we will make a small briefing about your horse and basics of riding; everything you need to know for the ride. After the first contact with the animals and a short test-ride, we start our trail. We set up along paths and roads, through the evergreen nature and ancient villages until we reach the coast. 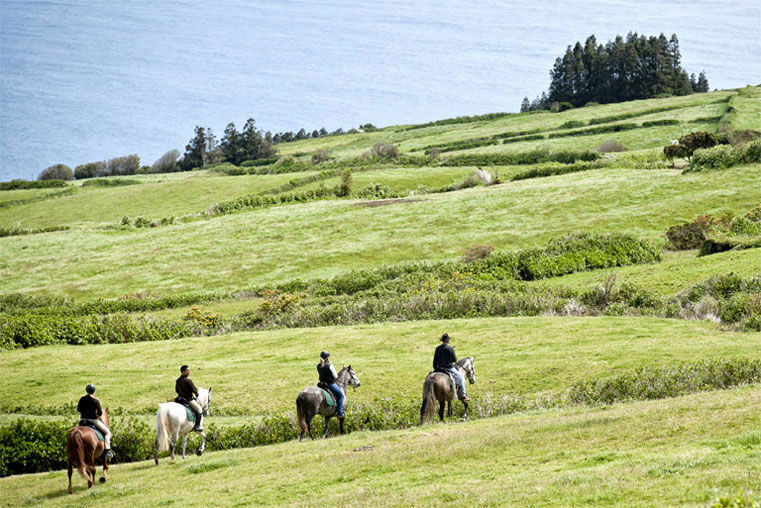 Riding your horse, you will enjoy the sound of the Atlantic Ocean waves, and enjoy stunning views of other islands. We return to Quinta do Flour Mills 1:30 later. If you wish (and book), we serve you a typically Azorean picnic, at our Quinta do Moínho gardens (drinks included). This option is not included in the tour price, you may book it in advance. Not Included Transfer (Possible to provide, under request). Through the old ways of the parish we dive in the azorean nature and laurissilva forest. We went through a small gorge, riding through green fields, with magnificent Atlantic sights. Galloping in a very nice scenery, we go to the yam fields of Cedros. Here we come to the highest village of the island, Ribeira Funda. Find here farmers ancient homes and a breathtaking view of the valley, numerous flocks of shearwaters singing in sky. Back to the Atlantic coast, we pass the old whale watching guard, "Cabeço da Vigia", located on a small hill, provide us 200 degree view of the sea. Luckily we will be able to watch the whales and dolphins. Returning to Cedros, our trail leads us through the houses of farmers until "Quinta do Moínho". 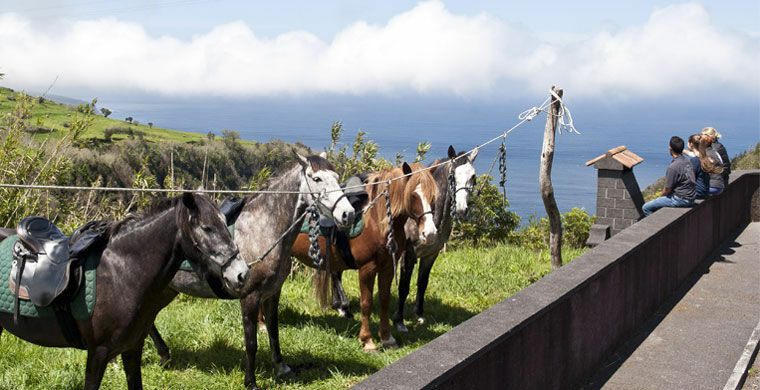 IMPORTANT NOTE This is a horseback ride on the island of Faial, Azores, in the Atlantic Ocean. Sometimes, there may be adverse weather conditions (such as wind and heavy rain). For safety reasons, the guide can change the ride route or even stop during the tour. Transfer on request, not included in the price. Meal Only Full Day Package, lunch is served as a saddlebag-picnic (drinks included). Clothing required waterproof trekking shoes, jacket and pants windbreaker waterproof, own riding helmet (contact us if you do not dispose of his). Skills required to ride, ride 3 or 5 hours in rural land Horses Pure Lusitano or Portuguese crossbred. Trained and docile. Height approx. 1.55 meters. 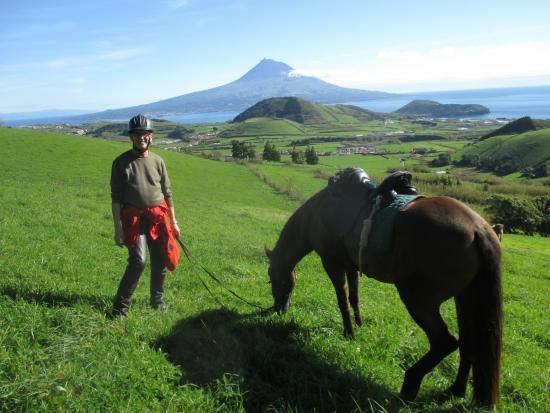 INCLUDES Experienced English, German and Portuguese spoken trail guide; gentle and trained trail horse; special trail equipment; lunch mostly Saddlebag - Picnic (Full-Day-Trail) incl. Drinks.